Ted Kennedy was born in 1865. He was a native of Peoria, Illinois and by age thirteen developed a fascination with baseball and the local teams of the area. One player that particularly intrigued Kennedy was the pitcher Charles Radbourn, a master of the overhand curve ball. Kennedy became a water boy for Radbourn's team and would position himself behind the backstop and watch the spin of Radbourn's ball as it would arc over the plate. 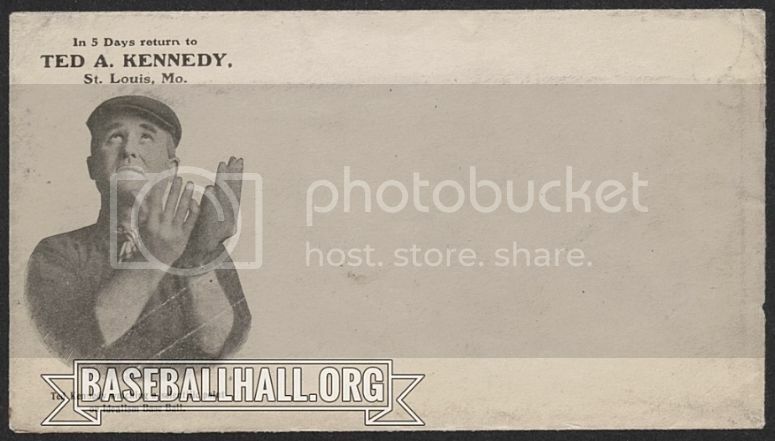 Kennedy soon approached Radbourn and asked him about the grip for his curve ball. 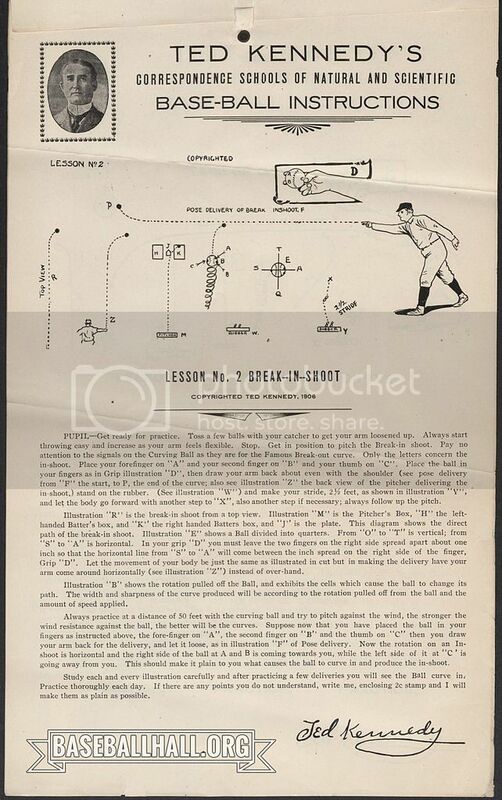 Radbourn obliged and after much practice Kennedy was overjoyed at mastering the pitch. Kennedy played ball with the local teams throughout his teenage years but was small and very light for a pitcher. He would only get spot duty on the mound and played a fair amount at third base. Kennedy overcame any physical limitations by developing a vast array of arm angles, grips and spins to eventually succeed as a starting pitcher. 1884 was his breakout year with an independent team in Keokuk, Iowa. The Carson/Rand team of Keokuk was loaded with quality players itching to advance into the professional leagues. Kennedy was one of the best pitchers and eventually moved up to the major league level with the Chicago White Stockings in 1885. He continued to play a few more years at the major league level but eventually injuries and arm weariness relegated him back to the minor league level after 1887. The 1888 Old Judge card above shows Kennedy with the Omaha team of the Western Association. Kennedy was with the Omahas during a 1888 game with the Kansas City Blues. It was there that Kennedy had a fateful conversation with the Blues catcher, Joe Gunson. Kennedy was intrigued with the makeshift metal reinforced mitt Gunson used to protect his injured fingers. The two parted ways and Kennedy eventually moved on to the Des Moines team where he played his last game in 1889. Injuries finally ended Kennedy's playing career and he stayed in Des Moines during his period of recuperation. 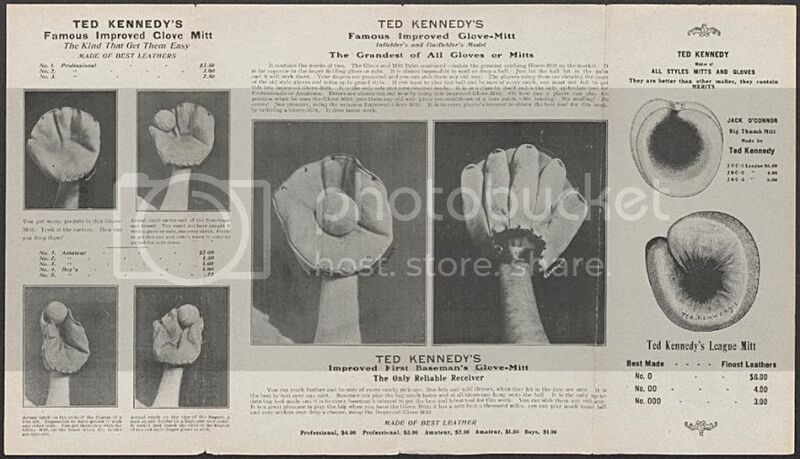 It was there Kennedy developed the design of a sophisticated metal reinforced mitt inspired by Joe Gunson's primitive version. Kennedy applied for a patent in May of 1889. Kennedy sent a telegram to Gunson at the time offering to sell the patent design. Gunson declined, observing that the metal framework was not a necessary element for an effective catchers mitt. Gunson had abandoned the metal reinforcement in his own mitt, realizing that substantial padding was enough to protect the fingers. Gunson also cited a mitt patented by Harry Decker of Chicago three months earlier in March of 1889 as more effective for a catcher. 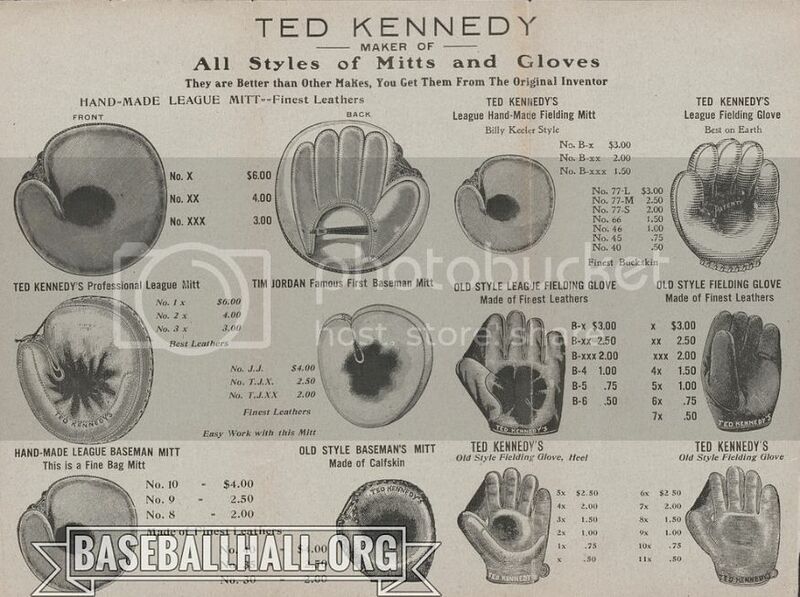 Still, Kennedy soldiered on with his elaborate design and moved to Chicago for a time to market his mitt. The Kennedy mitt involved a wire reinforcement anchored to a leather inner glove. 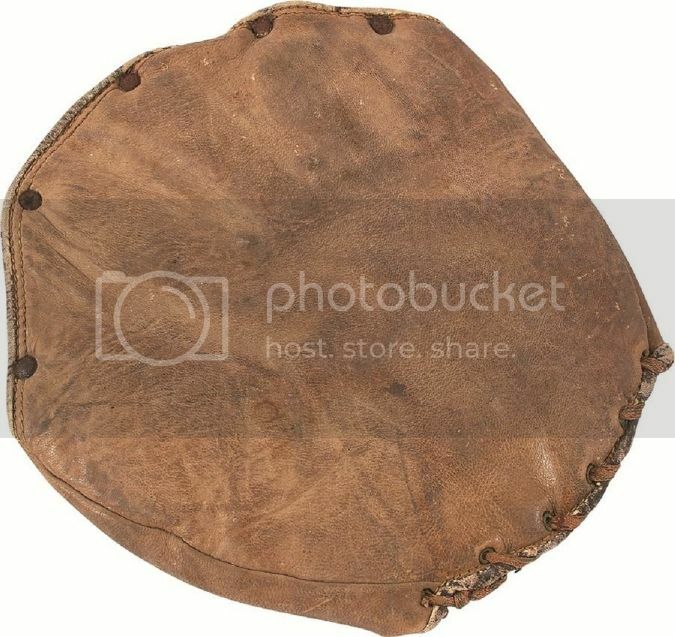 This was covered with a padding and a sheath of leather to form the mitt. 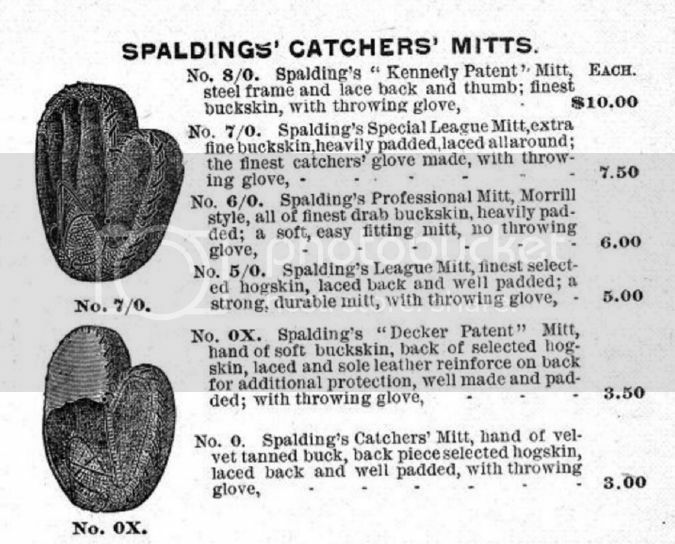 Below is an 1890's ad for this mitt dubbed the "League Backstop Glove". It was sold through the Frederick A. Field wholesale shoe company of Des Moines. The mitts were labor intensive to make and incredibly expensive for the time. Kennedy's business included a custom shop. 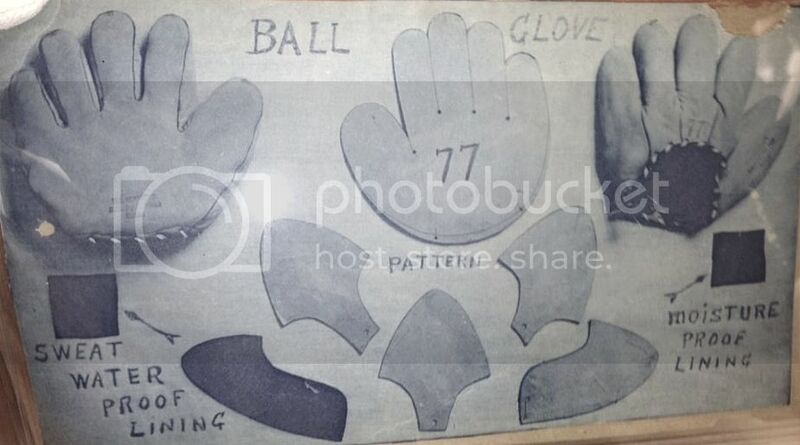 A player could mail in a drawn outline of his glove hand and a glove/mitt would be made to order. Last edited by mikesglove on February 18th, 2017, 8:05 pm, edited 3 times in total. 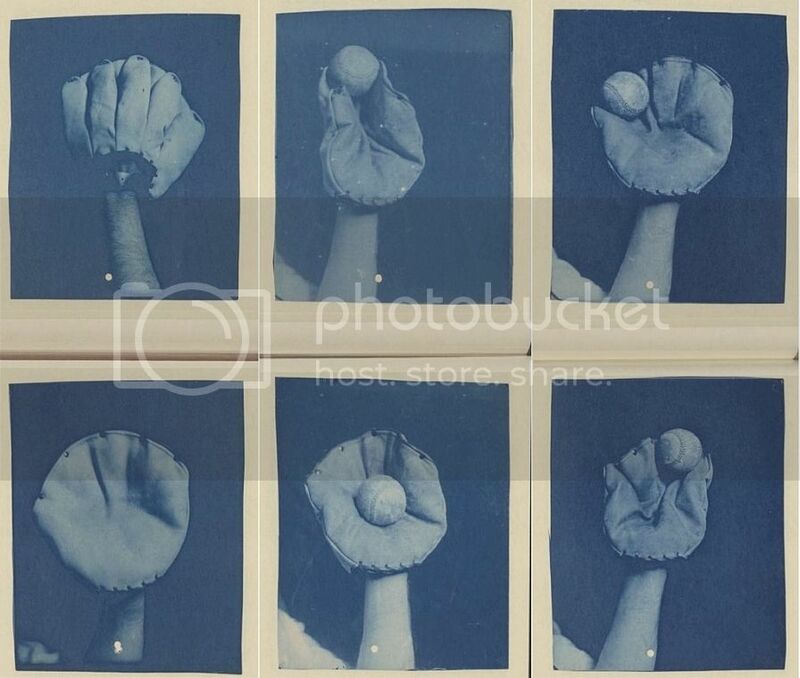 Below are the cardboard patterns for the "League Backstop Glove". One of the patterns is labeled as such. This is a small part of the Ted Kennedy Collection at the BBHOF. 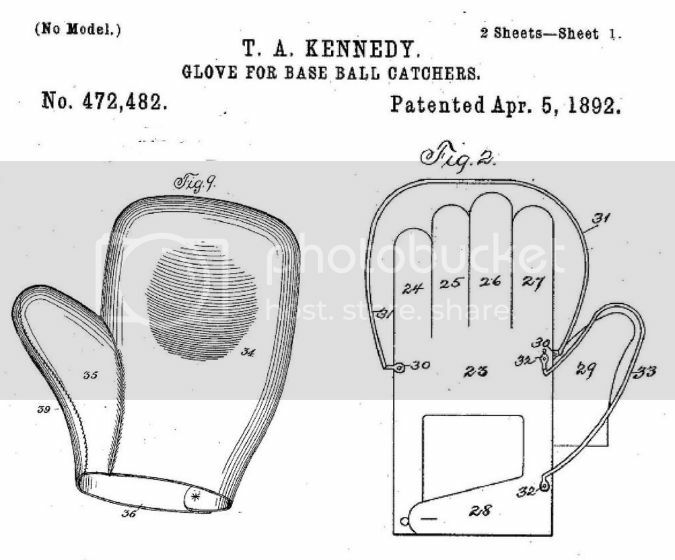 Kennedy eventually sold his patented design to A.G. Spalding and moved back to his home town of Peoria to pursue other glove/mitt innovations. 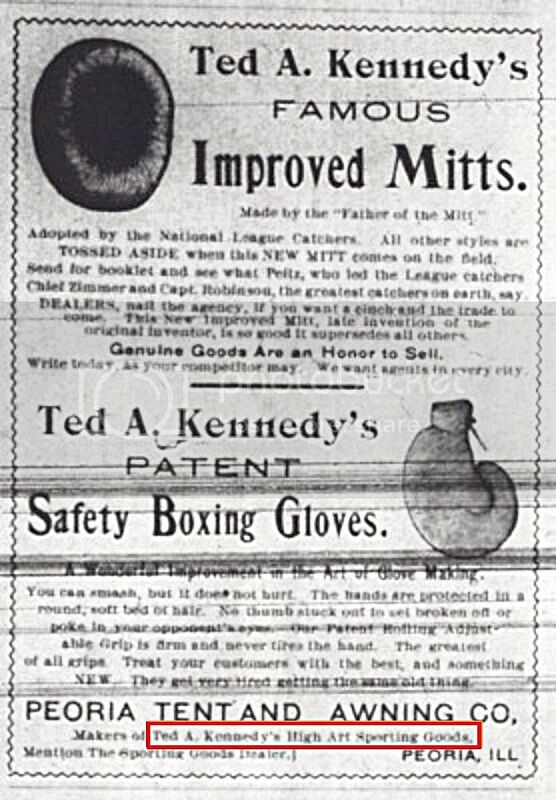 Below is a excerpt from the 1894 Spalding catalog describing the "Kennedy Patent" mitt. 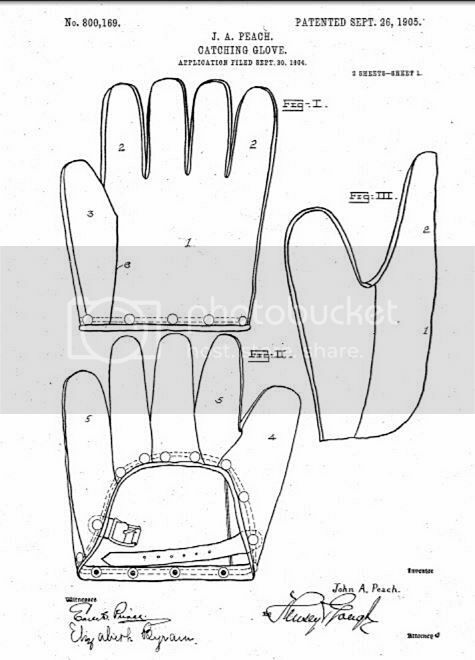 The "Decker Patent" mitt is also listed. As a side note, Harry Decker became very erratic in pursuing the manufacture of his 1889 patent design leaving his partner Paul Buckley to shoulder the load. Buckley wanted no part of going down that road alone and both Decker and Buckley agreed to sell the patent to A.G. Spalding. Brett did some excellent research on Ted Kennedy not available online. Here is Brett's write up of Kennedy's innovations in Peoria. 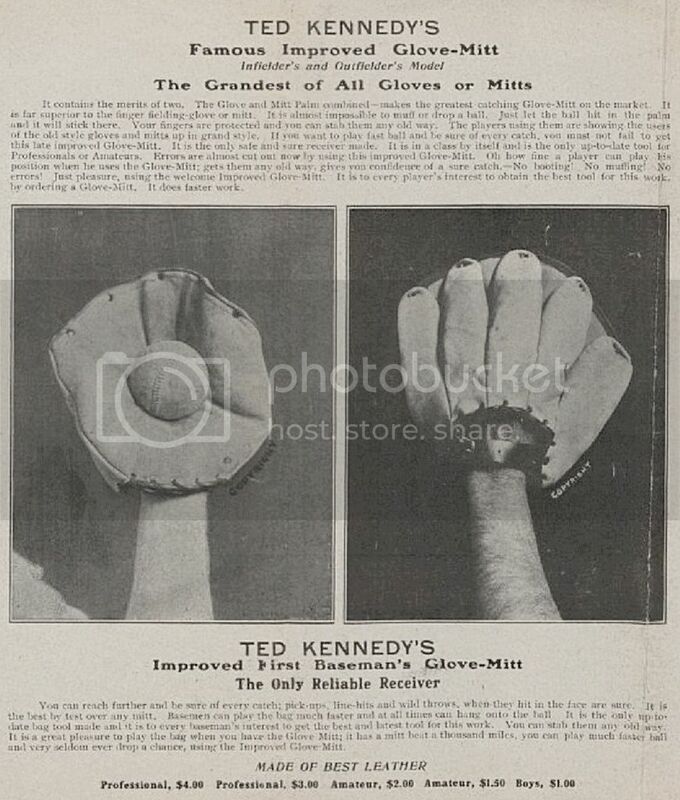 "Ted A. Kennedy's improved base ball mitts and gloves are now made by the Peoria Tent and Awning Co., of Peoria, Ill., who have every facility for turning out first class goods. 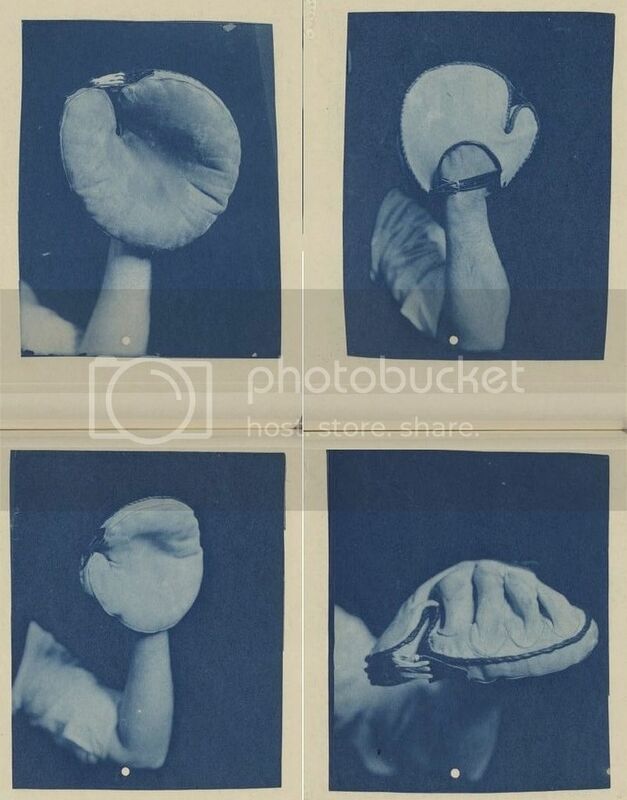 They are all made under the direct supervision of Mr. Kennedy, which in itself is an assurance of their high quality, as he was the original inventor of the base ball mitt and has been making such goods the greater part of his life. The full line of Kennedy mitts and gloves is original and entirely different from any other line of such goods. The catchers mitts are entirely thumbless, as is also the basemen's and fielder's mitts, and all have a deep pocket which aids materially in holding the ball after it is caught. A pitcher's blind and fielding mitt is another of the novelties of this line, all of which is described and illustrated in their twenty four page catalogue, a copy of which can be had of the above firm for the asking. Every dealer should investigate this line as it contains new features." Last edited by mikesglove on February 19th, 2017, 1:47 am, edited 2 times in total. 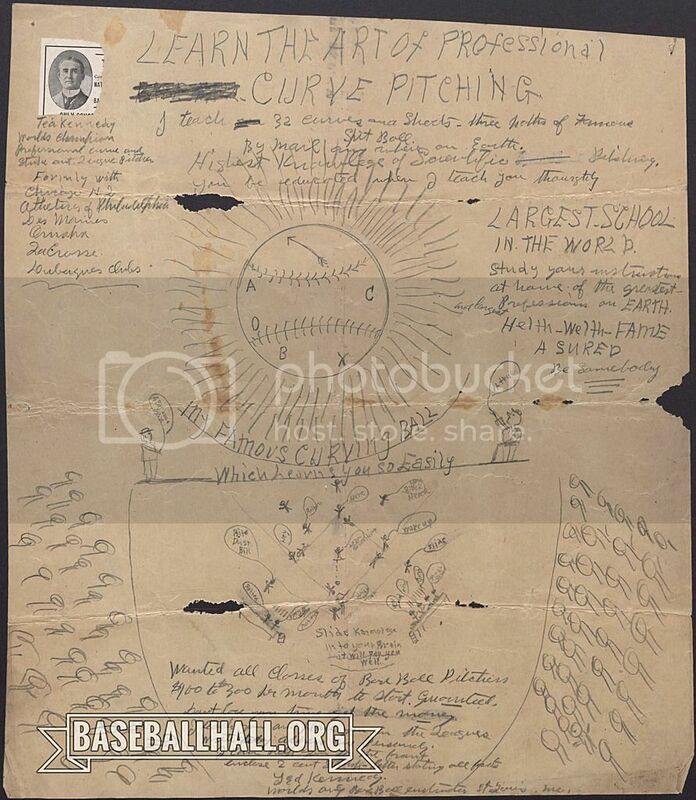 Kennedy moved from Peoria to St. Louis, MO around 1900 to continue growing his glove manufacturing business and new baseball instructional correspondence school. Below is an envelope from the St. Louis enterprise. 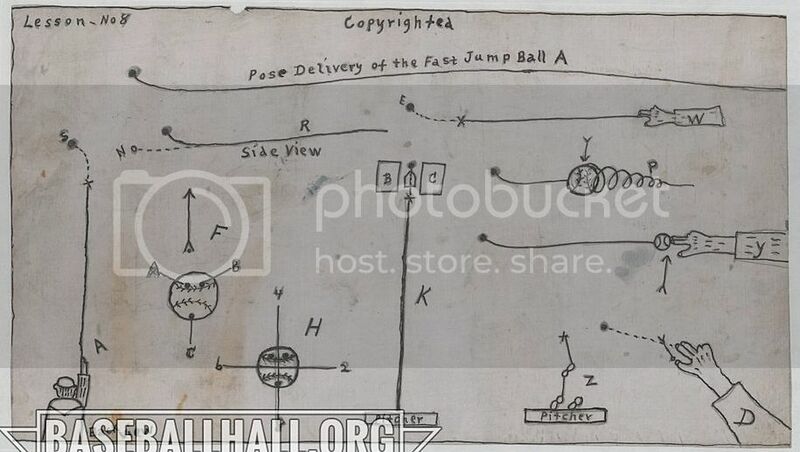 The BBHOF watermark is covering "Ted Kennedy Watching a Scientific Point on Idealism Baseball ". I think this refers to the scientific approach Kennedy used in his correspondence school. 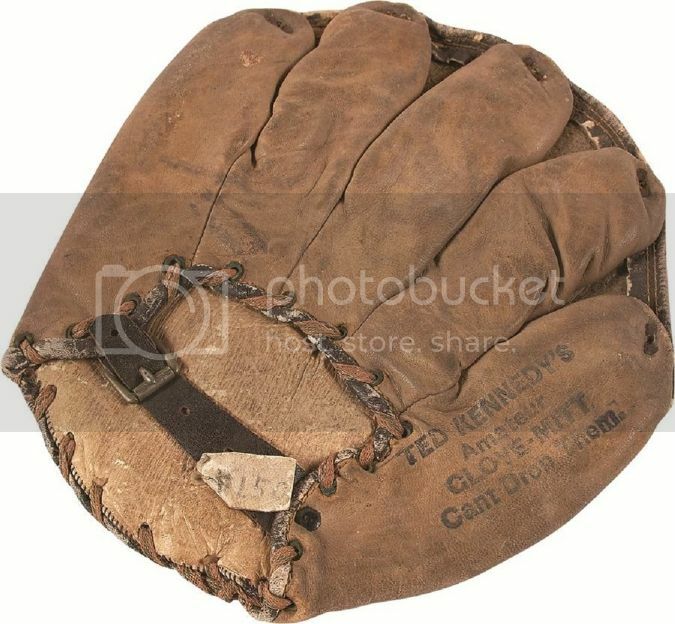 On the glove manufacturing side, one of his newest designs was a hybrid glove/mitt now called the "pita" mitt among collectors. Below is the cover and fold out brochure touting this glove/mitt among other models. The fabulous example below was the highlight of a 2016 auction. Last edited by mikesglove on February 18th, 2017, 9:02 pm, edited 1 time in total. Kennedy made a variety of traditional gloves and mitts in addition to his recent innovations. Below are a couple of ads circa 1905. The close up below of the "Professional League" glove describes a patent for a removable lining. 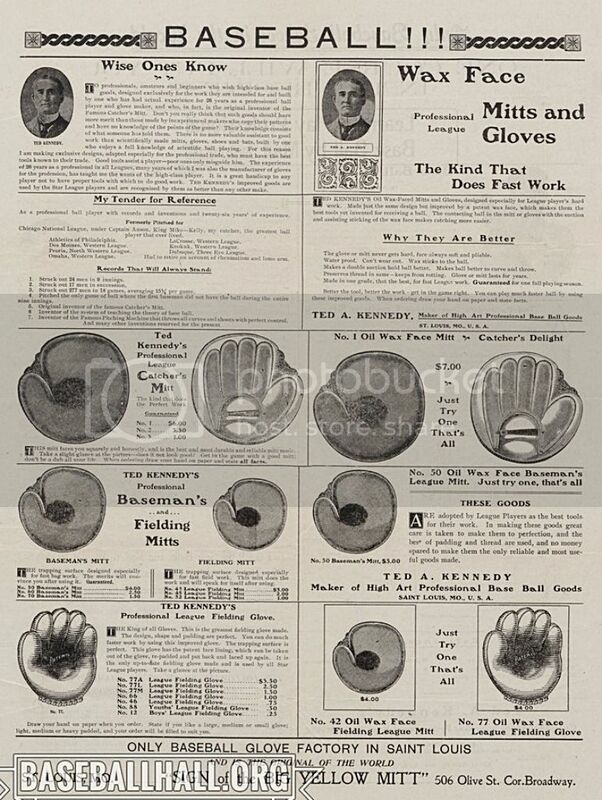 It is my belief that Kennedy used the John Peach removable lining patent of 1905 for his glove. The John Peach patent document states that lacing could be substituted for the button snap closure. Below is a view of the back of Kennedy's "Professional League" glove showing the laced wrist opening. 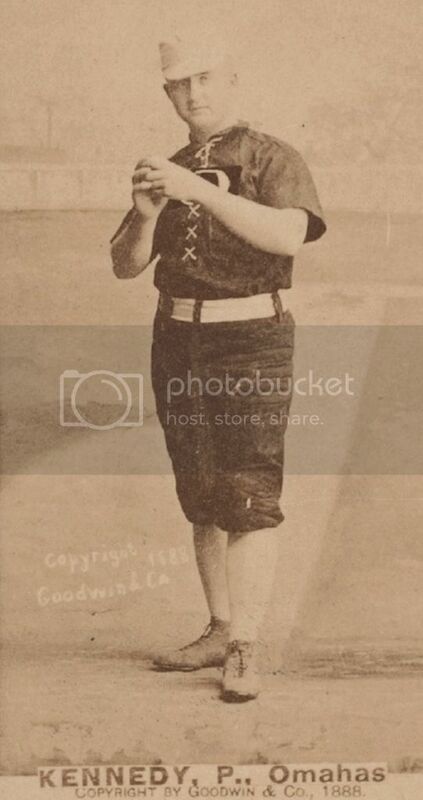 Below is a photo of Joe McGinnity in 1905 with the Kennedy "Professional League" glove. McGinnity was one of Kennedy's top endorsers at the time. Ted Kennedy assembled some cyanotypes of his earlier original advertisement photos into a homemade portfolio. 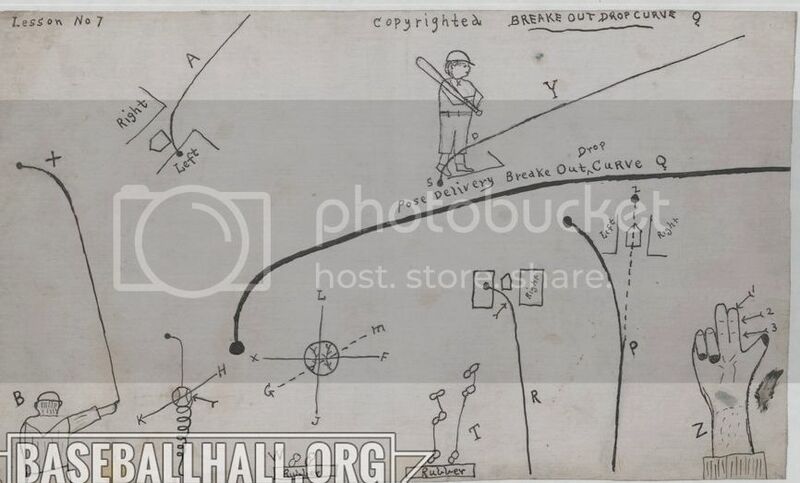 Below are a few rough sketches Kennedy prepared for his Baseball Pitching Correspondence School. I find the the sketches really fascinating in themselves. Kennedy developed dozens of pitches throughout his baseball career. He scientifically analyzed and illustrated them in the Correspondence School. The school aimed at educating prospective ball players to the art of pitching. The "Break Out Drop Curve". A finished course page with illustration and instructions. 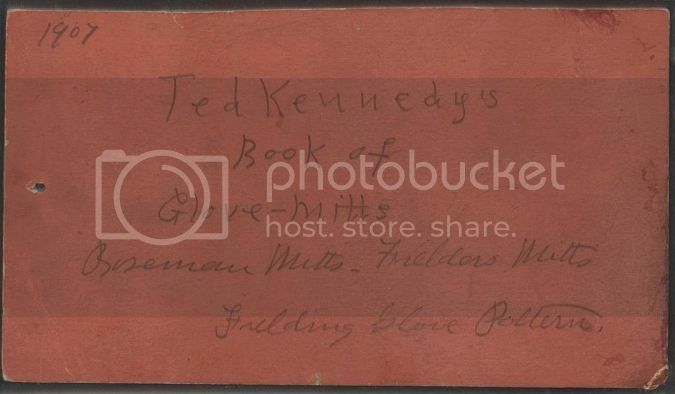 The link below from the BBHOF lists all 259 items in the Ted A. Kennedy Collection. They were donated by Ted Kennedy's grandson. Great memorabilia! The link below is a full history of Ted Kennedy's career. It is interesting reading. I just saw this. What catalog is this from? An excerpt from an 1894 Spalding catalog. 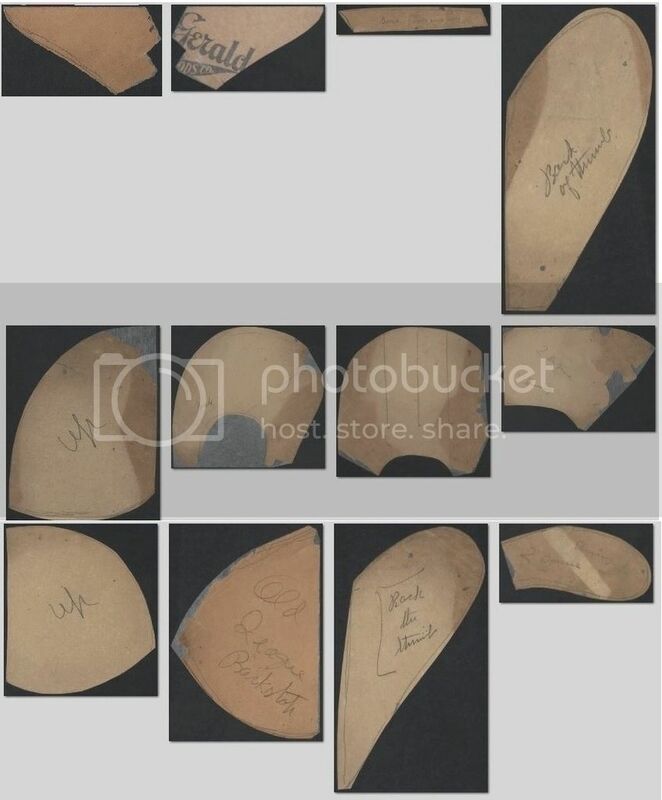 I didn't see anything like this in the 1894 Spalding catalog on JD's site? Yeah, would love to post the full catalog if you have it. Fantastic mitt! Thanks Brett. Page uploaded to the Library as: Spalding 1894 Catalog 3 (Kennedy).